This original and provocative text provides an approach to understanding the emergence and development of social rank through race and caste. The struggles we face in race and ethnic relations today are explored through anthropological, historical and sociological lenses to understand the roots of social hierarchy drawing on examples from the Indian subcontinent, the Caribbean, and mainland America. Chris Smaje is a Lecturer of Sociology at the University of Surrey. He holds degrees in anthropology, health policy, and sociology, and his research interests span the fields of medical sociology and the comparative historical sociology of race and colonialism. He is a member of the editorial boards of the journals Ethnic and Racial Studies and Sociology of Health and Illness. Part I: Race, Caste, and Hierarchy. 1. 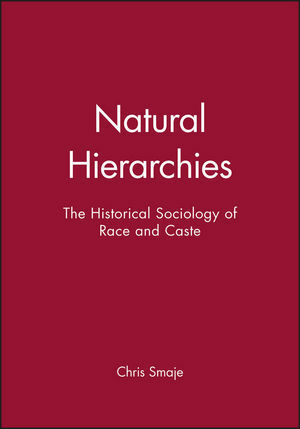 Race and Caste as Natural Hierarchies. 5. History and Ambivalence: a Place in the Sociological Debate. 9. Culture, Practice, and Symbol. Part III: Economic and Political Formations. 13. European capitalism, Indian Capitalism?. Part IV: Race, Slavery, and Colonialism. .
20. Race and colonial society. 21. Race and Political Thought in Early Modern Europe. Part V: Race, Caste and the Person. .
23. Race, Caste and Kinship. 24. Caste, kinship, and Gender in India. 25. Race, Kinship, and Gender in the Caribbean. Part VI: Race, Caste and the Nation. .
27. Race and the Creolization in the Caribbean. 31. Caste, communalism, and the Nation in Contemporary India. Part VII: Hierarchy and Politics. .
32. Hierarchy and a Sociology of Politics. 33. Hierarchy and a Politics of Sociology. "This wide-ranging book considers political ideologies, European colonialism, and classical and contemporary social theory, especially that of Marx and Levi-Strauss." S. D. Borchert, Lake Erie College. * Develops sociological theory of how race and status hierarchies are grounded in ideas of natural difference. * Offers critique of contemporary identity politics.